Sorry. Couldn’t resist. This is not something you see everyday! That said, this is only a tiny part of the attraction. There is a true preserve here and it’s pretty neat to see bears sleeping and eating and playing! 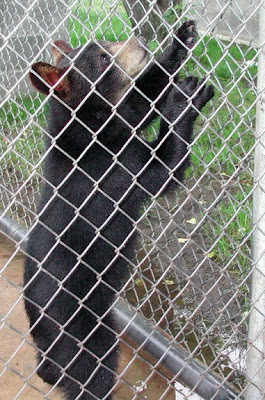 My favorite part of the visit were the baby bears. The Oswald’s keep the babies they are feeding and growing in a play area where they seem to have a lot of fun bathing and playing. They are absurdly cute! And the Oswald family walk in the cage and the little bears run up like puppies would do and let the man hold them! It’s crazy! Anyway, if you make a trip to Michigan’s upper peninsula, Oswald’s Bear Ranch is well worth the trip!